The Northwestern coast of Portugal is known as the Costa Verde (the Green Coast) thanks to a lush vegetation growing there. The walking path crosses fishermen villages, coastal sceneries, creeks, coves and also lovely sea resorts. The walk from Porto (Matosinho) follows the coastline towards the pretty old town of Vila do Conde, Povoa da Varzim, Esposende and Vila Praia de Ancora . The medieval town of Viana do Castelo and its Santa Luzia basilica is worth the detour. 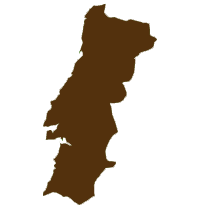 Then the route enters a rural area and back to the Atlantic coast near Caminha. The Coastal Way to Santiago along the coastlines of Portugal and Galicia, is attractive thanks to the rural scenery and historical towns and cities that this ancient pilgrim walking route crosses on its way to Santiago de Compostela. Short transfer from Porto to the start of the Camino. Walk along the coastline via a series of wide sandy beaches, nature reserves and fishing villages to the historical coastal town of Vila do Conde. Cross the residential areas that connect Vila do Conde with the seaside resort town of Povoa de Varzim.Today's walk mostly occurs along the coast between flowers and sand dunes and across beaches. Then head inland towards Esposende. After leaving the coast, you will cross villages, forest areas and reach Viana do Castelo that offers beautifu views on the Lima Valley from the long Eiffel bridge. Today’s journey is largely inland, with occasional coastal views from a series of hilltop villages. Enjoy the shade of the eucalyptus forest as you make your way uphill before descending to the low-key beachside resort town of Vila Praia de Ancora. VILA PRAIA DE ANCORA ⇒ A GUARDA (14 km / 8.7 miles) The coastal footpath links Ancora to Moleda and then continues to the charming town of Caminha. If you have enough time, make a detour through the pine forest beside the beach before catching the ferry across the River Minho to the peaceful fishing town of A Guarda in Spain. Follow the Camino through the town center and out towards the rugged coastline. A combination of coastal paths, forest tracks and tarmac roads to reach the small beachfront village of Oia, dominated by its 12th century monastery. The day begins with tiny fields, scattered houses and a few villages along the coast before a change of scenery and terrain as you cut across the mountains. A final descent through the countryside and outlying villages bring you into the medieval center of Baiona via two ancient churches. Once you leave the residential areas around Baiona, the terrain becomes more rural with villages and woodland areas. A brief section along a busy road and you are back among villages while aproaching Vigo. The Camino takes you through the Castrelos Park to avoid walking through the city. Private transfer from Porto to Matosinhos on day 2.